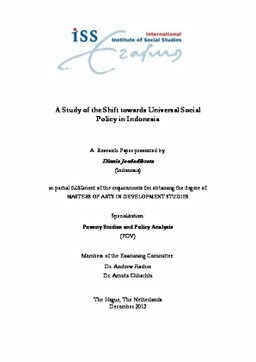 This research paper seeks to understand the perceived shift towards a more universal social policy in Indonesia, as demonstrated by the realisation of the Indonesian national social security system (Sistem Jaminan Sosial Nasional, in short SJSN). The SJSN features the principle of social insurance, and aimed to provide social security to all citizens of Indonesia. After many years of focusing on pro-poor and targeted approach on fight-ing poverty, there seems to be a change in trend to universalism in developing countries. Against this background, the case of SJSN in Indonesia is studied, to find out why Indonesia decided to follow this trajectory and whether there really is a shift towards a more universal social policy. Despite many criticisms on the technicalities of its implementation, the SJSN seems to promise a new direction towards a more rights-based, equitable social welfare. It could eventually provide security and protection also to those often denied of access, those who are not poor to be entitled to social assis-tance yet not rich enough to buy services. However, another closer look on how it emerged, evolved and developed may shed light on the possibility that SJSN is only sustaining the current Indonesian segregated welfare system.